Now, granted this might be hard because it involves some knowledge of my cookbook shelves pre-June 10, 2010. 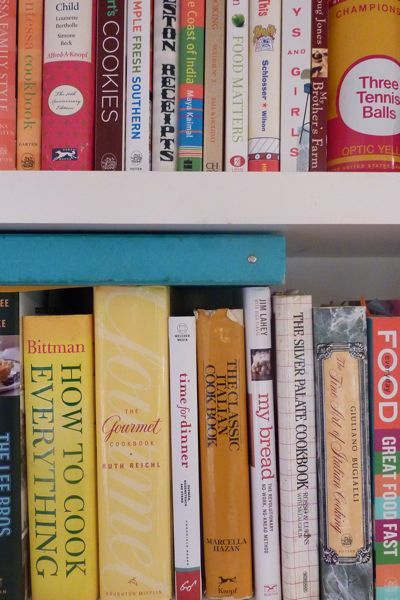 But the game is this: Can anyone guess what new cookbook has been added to my kitchen library? I’ll give you a hint. It’s wedged in between Ruth Reichl and Marcella Hazan, a few doors down from Martha Stewart and Bugialli and Bittman, underneath Julia Child and Mario Batali and Jim Lahey…? Give up? 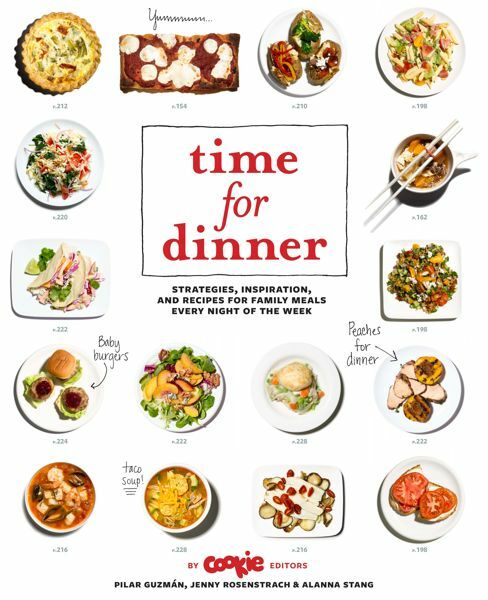 It’s Time for Dinner, the cookbook I co-authored with Pilar Guzman and Alanna Stang while we were all still at Cookie. Although the book doesn’t officially publish until September, I received a real-life, I-can-hold-it-in-my-hands advance copy by FedEx this morning and it’s hard not to be Abby-ish and imagine myself (and my cowriters) on the same shelf as my food heroes. But the thing is — there I am. There we are. Next to Marcella Hazan! I would love nothing more than to show you every single page in the 272-page playbook, but I’m going to restrain myself and just deliver some good news to all those former Cookie readers who have written to me telling me how much they miss the “So You Have A…” column. There is an entire chapter of SYHAs in the cookbook — 20 ingredients, 3 meal options for each, which means 60 total recipes. (Sixty recipes in just one chapter, btw.) For those of you new to SYHA, the column was one of Cookie‘s most popular pages. It charted recipes visually and the choose-your-own-adventure strategy (“head this way if you have pork; that way if you have pasta”) is tailor-made for parents who come in the door at 6:30, see a big bunch of swiss chard (or sausage or frozen peas or miso paste) in the fridge and need quick inspiration for how they can turn it into dinner. 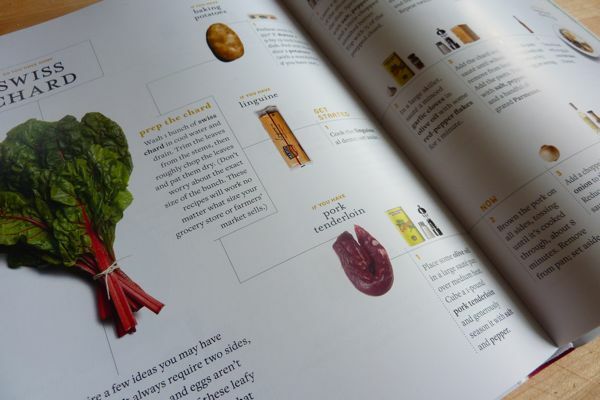 As addicted as I am to my digital recipe generating these days, seeing the flowcharted recipes spread across two pages reminded me how impossible it is to replicate the feeling of opening a book (see? It lies flat!) and getting inspired by lush photographs (thank you, Marcus Nilsson) and clean design (thank you, Number 17). Ok, I’m done now with the shameless self-promotion. Thanks for listening. I am SO EXCITED about this! Can it be pre-ordered through Amazon? This particular section of Cookie magazine was the entire reason I was a subscriber for so long. I loved the dinner suggestions and the visual way they were presented. I really can’t wait! I loved the “so you have a…” section. I still have them tucked away in a file…that sounds a bit pathetic? Congrats on the new book! I’ve already pre-ordered! Can’t wait! great news about book being delivered. Yahoo, I can’t wait to get this…it seriously looks awesome! I just checked Amazon.ca (where I live) and it says you can pre-order now here as well…. Congratulations! Can’t wait to buy a copy of my own! can’t wait to get this!!! it looks amazing!!! I’ve had it on my pre-order Amazon list for at least a month, I was excited to see a sneak of the book in your post…….now don’t be too much of a tease……I say you share a recipe (with the picture from the book!) with us……….PUHHH-LEEEEZEEEEEE……..We can’t see it till September!!! OHHH excited! So should put a Amazon pre-order link on your web site then you get a percentage -well, I don’t know how you feel about this but I think I’d like more of the money to go to you! Done being bossy pants and ready to say CONGRATS!!! Congratulations. The books looks great. PS I love the tennis balls on your book shelf! Perfect. Elizabeth – I love those WIlson balls, too. The can is still UNOPENED from probably the early 80s. They were a gift from my Uncle Julian. What amazing news. I can’t wait to see it.